Hello hello! I have something small and fun to show you today. First take a peek at these sweet necklaces - the pendants are made from sewing bobbins and vintage buttons. If you want to make a bobbin bauble - an oldie but goodie, from way back in the history of this blog - here's the original tutorial. 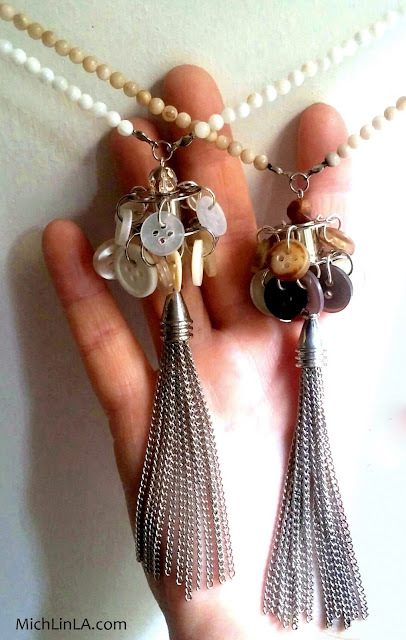 To create a necklace, all I did was add two beads up the center of the bobbin, with loops on both ends. One loop got a tassel, the other got a beaded necklace. Done! 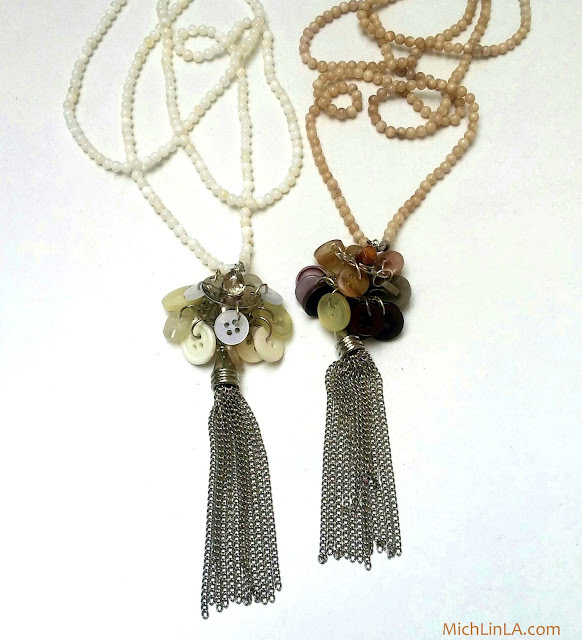 The thing I wanted to mention is the two colors of beaded necklaces. Both are mother-of-pearl...one is pure white, the other's a darker version. Both started out white - and I tea-dyed one to match the sepia-tone pendant. 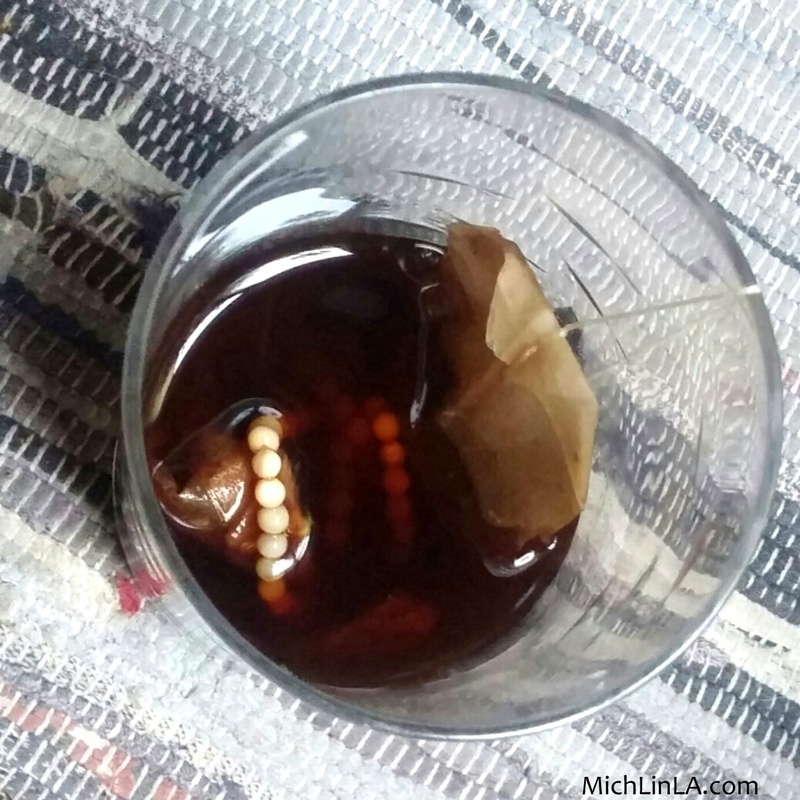 Most crafters have heard of tea-dyeing fabric, but did you know you can tea-dye beads? So simple. Just soak them in a small amount of water, along with several used tea bags. The length of time you need to soak them will vary. With these ultra smooth and hard MOP beads, it took overnight. 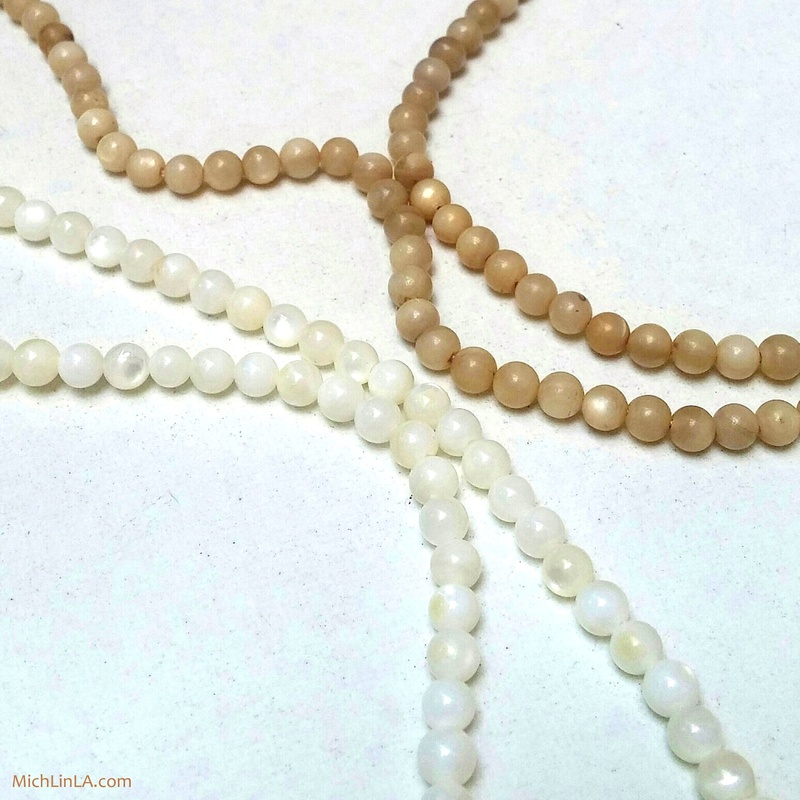 A more porous material (like bone beads) would be a much shorter soak. Just keep checking every hour or two until you reach the color you like. I happen to have a long drawn out cold (going on three weeks now) and have been drinking lots of tea. Next time you or a loved one is sniffling sick, save the tea bags and try a little tea dying magic. Hello to you too! You got something out of the cold then! These gorgeous beads! I hope you feel better soon! Thank you, Zografia! I hope so, too...but luckily making jewelry can usually happen even when I'm sick in bed. Creating these little treasures would make me feel better too. SO darn clever as always! Gracias, Sandra! Tal vez genialidad, tal vez una cabeza demasiado grande au cause de la grippe? hee hee. I love the look of the tea dyed beads. Really beautiful! Thanks so much for sharing at Vintage Charm. I'm pinning so I can refer to this later. I hope you feel better soon. Thanks so much, Tuula! I feel that your vintage style definitely demands tea dyed beads. Love, love, love the idea of tea dyed beads! Oh gosh, thank you, Jessica! I already feel better because three weeks stuck at home with my beads. This is one brilliant idea! I have seen Tea/coffee paintings but never thought about tea dye beads. Very smart.. I hope you are perfect now. I am sorry I am late in checking your post.